Ipomoea alba is an impressive vine with heart-shaped leaves and huge, pure white flowers that open in the early evening, staying open all night long and closing in the late morning. The 6" wide flowers have a sweet fragrance, and they attract night-feeding sphinx moths. On a trip to Oregon, we saw moonflowers growing wild by the roadsides. There was a patch of them growing behind the hotel where we stayed, and I enjoyed gazing out the window at them late at night. They illuminated the hillside as they glowed in the moonlight. Ipomoea alba can be grow on fences, trellises, arbors and pillars. Or grow it in a large container with an obelisk. It can also be grown as a groundcover. 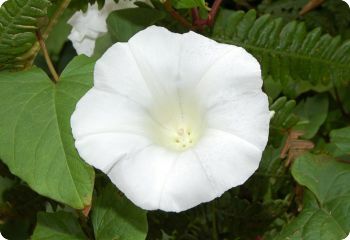 Common names include Giant White Moonflower, Moon Vine, Moonflower Vine, and Tropical White Morning Glory. Latin names include Ipomoea noctiflora, Calonyction album, and Calonyction aculeatum. Ipomoea alba is a tender perennial in zones 8-11. Grow as an annual elsewhere. Nick ipomoea seeds and soak overnight. Sow outdoors after the last frost date, 1/4" deep. Start indoors 4 weeks early in short summer areas. Full sun.